1. This magnetic cable is exclusively sold by NetDot and shipped by Amazon, purchase anywhere else may result in no warranty. 2. Gen 3 version is the latest design with super magnet which is not interchangeable with Gen 2 or any other cables. 3. It is standard usb 2.0 charging cable which charges slower than usb 3.0 or 3.1 cable. Stop using it if it is getting overheat in case of excessive current. 4. Please keep it clean and dry, if needed, us a dry cotton swab to clean the plug and cable interface. 5. Do not test the magnet strength by pulling upside down your mobile devices, it may cause damage. 6. 1 year warranty, human damage not included. NetDot Gen 3 magnetic cable, the best magnetic charger in the market, super strong magnet,support 9v/2a usb2.0 fast charging & sync for Android smart phone. Both sides support charging while only one side for data transmission, led light will turn on when power on. It is a simple yet perfect solution to prevent frayed charging cables, tripping over cable resulting in smashed phones, pointless fiddling to plug in cable in the dark and more. While it is out of charging, the magnetic connector can be used as anti-dust plug. 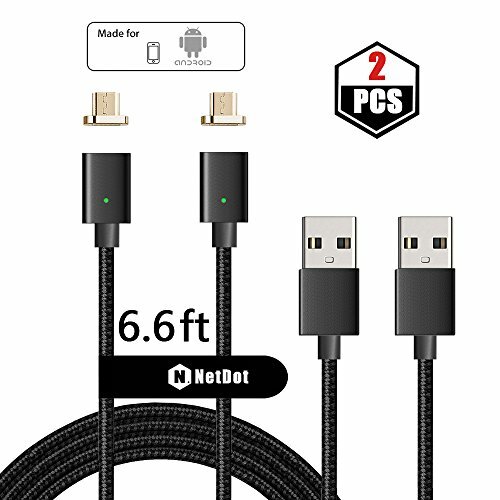 Perfectly compatible with most of android system with micro usb port, but Samsung S7 / S7 Edge / Tab S may not work by chance.The micro usb plug works for all NetDot 3rd generation cable but it is not compatible with NetDot 2nd generation cable or any other cable. 1 year Warranty: Support refund or perfect replacements within one year for any quality issue, human damage not included. If you have any questions about this product by NetDot, contact us by completing and submitting the form below. If you are looking for a specif part number, please include it with your message.